I took this picture before I cleaned everything up. The green jars, I just liked, but I’m not sure about the lids- should I paint them? if so what color? leave them off? fill them with something? I’m collecting white dishes of any sort – not sure if you can see, but the gravy boat has some beautiful green pattern on it and it was calling my name to take it home. ? The bird cage, I’ll probably paint white and put it in my new office – one problem though, I don’t think it opens any where? I was hoping to sit something inside of it. The little silver dish, is just adorable, I thought I would be pretty on my desk to hold paper clips. The BEST part? I got ALL of this for $17 WOOHOO! Head over toSouthern Hospitality and see what Rhonda and others are finding in their Treasure Hunting! Sarah at Thrifty Decor Chick is having a Goodwill party!! 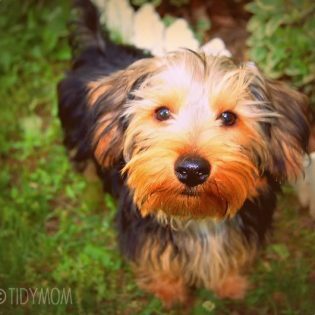 I didn’t link this post but I did link up a few of my older posts. You should check out her party! I love that mirror! I’ve been looking for one like that to put on my porch. And a little birdcage too, to put a little plant in. You got some great deals! I have a birdcage almost exactly like that one and it’s still green because I have figured out what to do with it yet, cost me $1 at a garage sale last year. I bet you can use wire cutters to make yourself an entrance into that cage, just not sure how you would close it back up. If it will sit somewhere, you can just make the hole in the bottom and place it over something, but if you want to hang it, that gets tricky, but I am sure it can be done. I would use those jars as vases, I love them. oooh, that’s a good idea Bella, it will be sitting, so I could just clip the bottom off! Great finds! 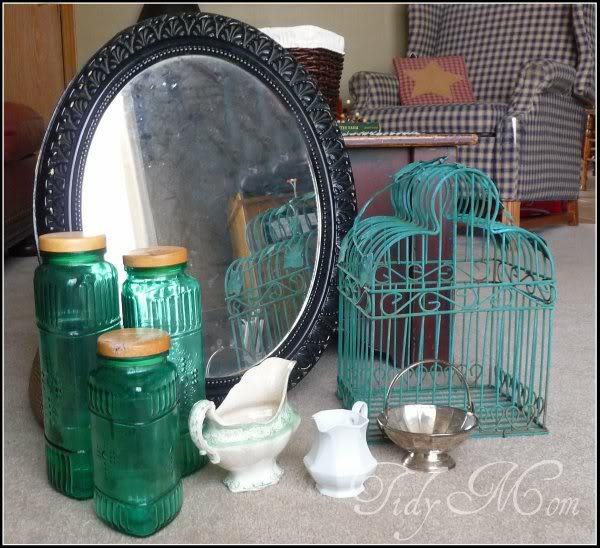 Love that mirror and the green jars especially! A silver leaf on the jar lids would be pretty! Cheryl, those are some really neat finds! Love the white dishes and the green bottles. Great mirror too. Thanks for joining the party today. Awesome treasures! I'm a sucker for bird cages and that little one is so adorable!